I haven’t even finished my current project, and yet, here I go starting something else, SearchingForRosie.wordpress.com. Just a note too, this is one of the things I love about my colleagues there may be a bit of good natured competition (which feels to me more like, hey– if she can do it so can I!) ultimately we’re on the lookout for opportunities for each other, are happy to share tips, look over each others work before we submit, and even offer one more read and critique. “They’re publishing one of my essays… for ‘mom week’ and I thought you might want to send them something,” Elizabeth said. Although I have a TON of stuff written about my Mom, I struggled to pull something together that would be a cohesive essay, and would fit with the tone of StyleSubstanceSoul.com. The vibe over there seems to be a uplifting, positive messages for women, a sort of “Live Your Best Life” vibe (more on that later). I wasn’t comfortable sending some of my drearier writing (you know, death, cancer); it didn’t feel right. 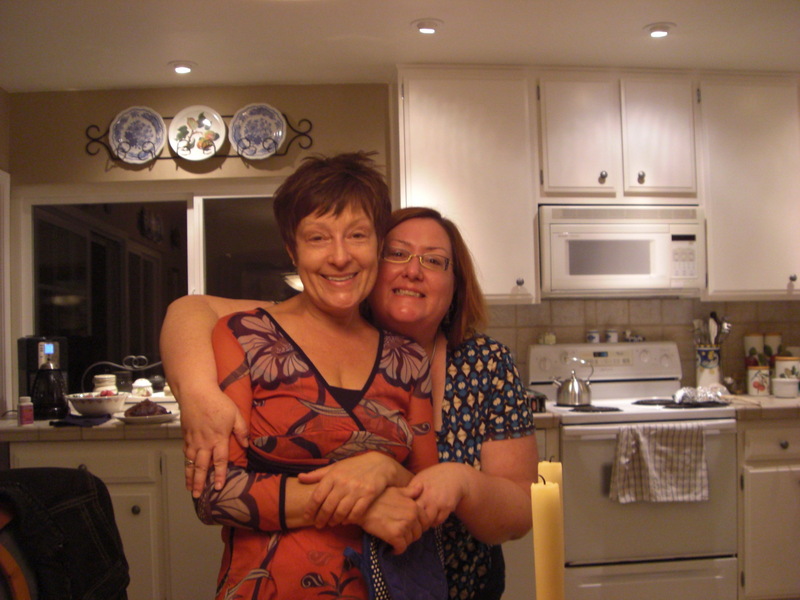 Instead, I sent them, “Mom’s Chicken Divan,” adding a few more orienting details, and I removed my former roommate from the story, mostly to narrow the persona– it was a short piece, not enough room to develop too many characters (sorry Susann!) Anyway, they accepted it, and Lois (the creative director/editor) even made a few edits (with my permission) that really helped the piece. I read through all 200 pages. THIS was the hard part (except for the part where I was doing said reading in the lovely Willard Reading Room in the library.) Some of the text I wrote back in 2005, and as I look at it now I see how much is missing: setting and reflection, for example. Oh and context. The good news is that I’ve learned a lot in this MFA program. I marked places in the text where more amplification is needed, and created a To Do list, that is at once comforting and overwhelming. Some entries on my list are simple like, “Edit, edit, edit!” something I can do with one hand tied behind my back. Other notes are “Add more reflection,” which means I must do just that– reflect. And then of course, write about it. You can never go wrong when you quote Toni Morrison. I imagined my life like a river back east, lush with trees and green practically dripping from the banks into the water, and curving so that you could not see what was ahead. It’s strange that this is the kind of river I imagine when I’ve spent more of my life near the Colorado River or the Rio Grande River, or any other river in the southwest that is not shrouded in green shrubbery. 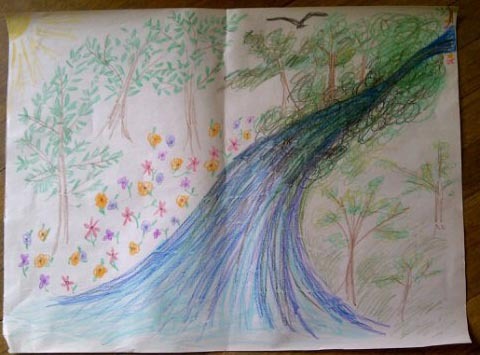 Then Michelle asked us to DRAW this river. I know some folks were resistant, but I find it very helpful to try to express myself in a medium other than writing– what Sharon Warner calls “getting it off the page” so I was excited. There is something liberating in drawing, where I don’t have any pre-conceived notions that I am going to do a good job. As I imagined this river, and thought about my mother’s death, I draw that time in my life as a curve in the river shrouded in foliage so dark I could not see around the bend… On the side before the river’s bend I drew a lighter brighter area, with the trees well-defined to represent that life was good, it was sweet– but the subtext would be, is anything ever this perfect? pretty pink and purple and yellow flowers, the sun always shining? When I stepped back and looked at this river drawing I realized how easily I had slipped back into an old pattern of looking at everything as a problem. And let me tell you I went to town drawing that bend in the river, scrawling the darkest greens and blacks and blues. It was a dark time, but as I looked at my drawing, it dawned on me that I don’t think of everything as dark, or dreary (at least not ALL the time). Fortunately (or subconsciously?) I had left empty a small area in the upper right corner of the paper (you can’t see it very well in the above photo), so I drew in some perfect flowers, and a nice tree, and even a little sunshine. My way of saying, Hey. I don’t know what’s around that bend, but I know it will be okay. I will be okay. And if history is any indication, I know that is true. I may not know where I will land, but I do know I will land on my feet.